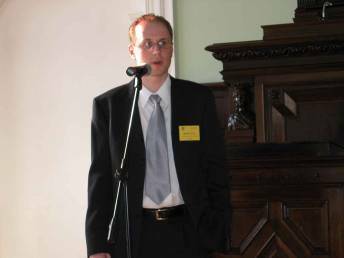 In August 2014, University of Latvia SPIE student chapter celebrates its 10 year anniversary. It is interesting to look back how the chapter has changed during those 10 years. The founder and first president of this chapter was Renars Erts. He was the president for 4 years. At the beginning of ULSPIE student chapter, there were 17 members. 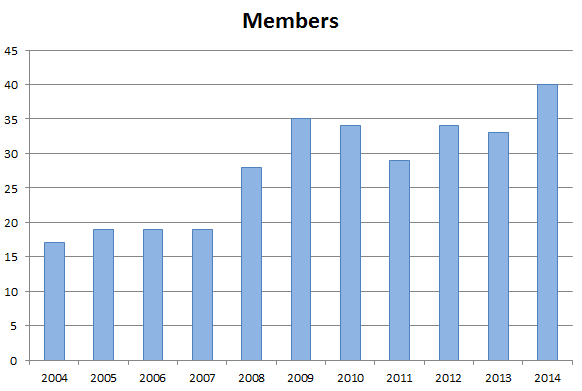 Now, in 2014, the member count has increased to 40. 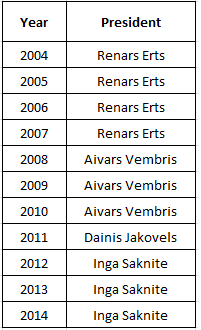 In 2008, Aivars Vembris became the president of ULSPIE student chapter and stayed in this position for 3 years. In 2011, Dainis Jakovels was elected the president. Inga Saknite became the first female president of the chapter in 2012. Since year 2005, chapter members have been involved in organizing the largest student conference in Latvia. In 2005 it was called "Developments in Optics and Photonics". During the years, it has changed to "Developments in Optics and Communications", and is held each year in April at the Institute of Solid State Physics in Riga, Latvia. Every year, an officer of the chapter goes to the Leadership meeting in San Diego, California: Renars Erts, Roberts Paeglis, Aivars Vembris, Edgars Nitiss, Elina Laizane, Dainis Jakovels, Inga Saknite, Ugis Gertners, Tatjana Pladere. Some members have been awarded SPIE Travel grant to attend conferences like Photonics West, Optics & Photonics: Inga Saknite, Amina Bekina, Brigita Zutere, Marta Lange. Chapter members have organized different activities to promote Physics research and applications to students, school children and general public by organizing weekly seminars, monthly lectures and practical work for school children and telling about their research during annual "Science Night" event. In 2014, in order to promote SPIE amongst undergraduate and graduate students of Physics, the first Pizza Party / KHET Laser game tournament / Movie Night was organized. It resulted in 7 new members for the chapter. In 2014, the 10th international student and young scientist conference "Developments in Optics and Communications" was organized. During the Welcome party, former organizers of the conference were welcomed and told about the first years of the conference. More than 130 students from around 20 countries participated in this 10 year anniversary conference. We are looking forward to new ideas, new challenges and welcoming more members to our chapter! We believe that year 2015 will be special and we are all looking forward to celebrate the International Year of Light.